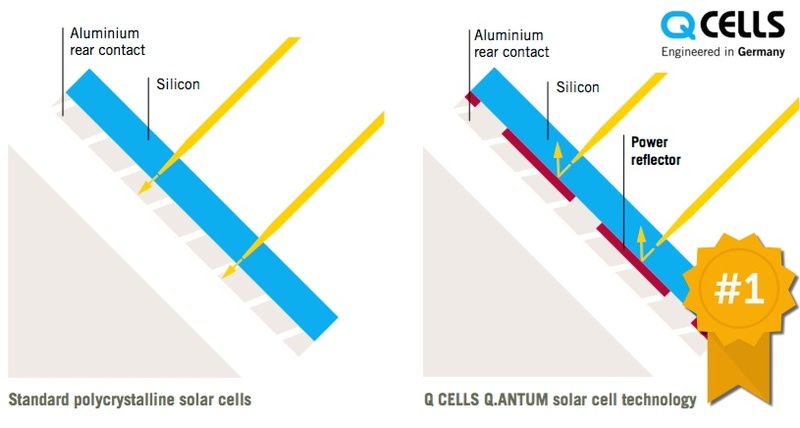 Q-Cells clever Q.ANTUM design of solar cell promises better efficiency for cheaper, multi crystalline panels. Hanwha Q Cells has smashed the record for polysilicon solar panel efficiency like a robot driving a steel fist through a fragile silicon wafer. They have achieved an efficiency of 19.5% with a standard sized panel, 1.67m by 1m in size. The module is 301 watts and Hanwha claims it was produced using standard processes on industrial scale production equipment, which means it should be ready to go into production. It is possible you are thinking, “What’s the big deal? Two months ago you told us Trina had achieved 23.5% efficiency”. But it is not the same thing. The Trina record involved monocrystalline silicon which means the solar cell is cut from a single large silicon crystal, while Hanwha Q Cells used polysilicon, sometimes also called multicrystalline silicon, which is around 12% cheaper after it has been sliced into wafers. Also, Trina’s record was for a single large cell, while the Q Cell’s was for a whole solar panel and a panel will always have slightly lower efficiency than the individual cells it is made of due to wiring and other loses. The module uses Hanwha Q Cell’s high efficiency Q.ANTUM solar cells and we can be sure the efficiency of 19.5% is the correct figure, because Hanwha Q Cells is a company that dots every i and crosses every t. In fact, they have so many dots they put one in the word Q.ANTUM instead of the letter U. We can also be certain efficiency figure is accurate because the panel was independently tested by Fraunhofer ISE. The ISE stands for Institute for Solar Energy Systems despite the fact that ISE is only three letters. What can I say? Mrs. N. Hofer is obviously a very busy woman, as she employs over 24,000 people, and so she must have forgotten to put the necessary extra S on the end of it. Or, just possibly, it actually makes perfect sense in German. Either one. The module makes use of Q.ANTUM solar cells’ reflective nanolayer technology. I have no idea what this is, but apparently in addition to reflecting nanos, it also reflects light back through the solar cell so that any photons that didn’t generate electricity on their first trip through the get a second chance on their way out. Whatever it is, if it is cheaper than using silver and about as shiny it could be a useful way to keep costs down. Hanwa Q Cells Q.ANTUM line of solar panels have a 12 year product warranty, which is the third longest of any panel I am aware of, and are guaranteed to degrade by only 0.6% or less per year. Any panel produced that uses the new record breaking technology will presumably have a similar warranty or possibly something even better. If you want Q.ANTUM technology on your roof, it is currently available in Australia in the QCells Q.PLUS-G4.1 panel with a panel efficiency up to 16.8%. Hopefully the record breaking 19.5% panel will soon go into production and through using cheaper polysilicon and other cost cutting measures will help bring the price of high quality, high efficiency, tier one solar panels down even further. Is there a current carbon credit price anywhere in the world????? Richard, billions of people live in nations or regions with some form of carbon pricing, whether is is a comprehensive emission trading scheme or carbon tax, or a more limited form such as India’s coal tax. In a large number of places it is possible to get a carbon credit for activities that either remove carbon from the atmosphere or prevent CO2 or other greenhouse gases from entering the atmosphere. 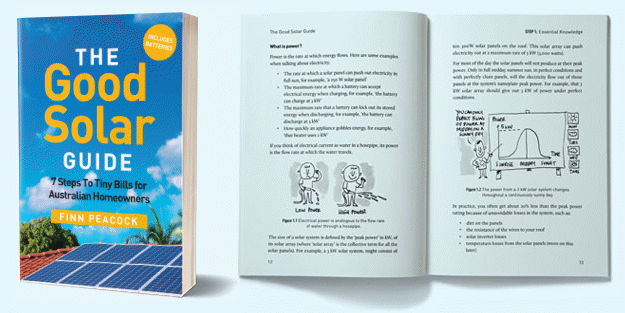 1) How does Q-Cell panels compare with say Winaico or Sunpower panels. Was told that Q-Cell panels perform well in low light environment as well as over a range of temperatures, hence have better power production than other panels. Also there is PID and Hotspot protection. 2) Have you heard of an installer OHM Electrical Services? Their prices appear sharp. Also is Q-Cell a smart panel i.e fitted with Maxim chip to enable individual panel optimization? Their Q.PEAK-G4.1/MAX panels does have Maxim panel string level optimization but, as far as I am aware, their others don’t. You will see a chart where we list all the reliable solar panel manufacturers in Australia that we are aware of. QCELLS and Winaco share about the same position, but SunPower and LG Solar are ahead. If you are willing to pay more for premium panels you can get higher efficiency and reliability, but I wouldn’t worry too much about specific claims made by manufacturers. Panels in a similar price range typically don’t differ by much. And answer the questions as best you can.